The German Instrument of Surrender was a document which ended World War II in Europe. The definitive text was signed in Karlshorst, Berlin, on the night of 8 May 1945 by representatives of the three armed services of the Oberkommando der Wehrmacht (OKW) and the Allied Expeditionary Force together with the Supreme High Command of the Red Army, with further French and US representatives signing as witnesses. The signing took place 9 May 1945 at 00:16 local time. An earlier version of the text had been signed in a ceremony in Reims in the early hours of 7 May 1945. In the West, 8 May is known as Victory in Europe Day, whereas in post-Soviet states the Victory Day is celebrated on 9 May. There were three language versions of the surrender document. The Russian and English versions were the only authoritative ones. that the capitulation of Germany should be recorded in a single document of unconditional surrender. The committee further suggested that the instrument of surrender be signed by representatives of the German High Command. The considerations behind this recommendation were to prevent the repetition of the stab-in-the-back legend, created in Germany following defeat in the First World War; since the act of surrender in November 1918 had been signed only by representatives of the civilian German government; militarist circles would subsequently claim that the High Command of the Army carried no responsibility for the instrument of defeat. It is impossible at present to foresee in what circumstances hostilities with Germany may in the end be suspended. We cannot tell, therefore, what mode of procedure would be most suitable; whether, for example, it will be found best to have a full and detailed armistice; or a shorter armistice conferring general powers; or possibly no armistice at all, but a series of local capitulations by enemy commanders. The surrender terms for Germany were first discussed at the first EAC meeting on 14 January 1944. A definitive text was agreed on 28 July 1944, and was then adopted by the three Allied Powers. The agreed text was in three parts. The first part consisted of a brief preamble "The German Government and German High Command, recognising and acknowledging the complete defeat of the German armed forces on land, at sea and in the air, hereby announce Germany's unconditional surrender". The instrument of surrender itself followed in fourteen articles. The second part, articles 1-5, related to the military surrender by the German High Command of all forces on land, at sea and in the air, to the surrender of their weapons, to their evacuation from any territory outside German boundaries as they stood on 31 December 1937, and to their liability to captivity as prisoners of war. The third part, articles 6 to 12, related to the surrender by the German Government to Allied Representatives of almost all its powers and authority, the release and repatriation of prisoners and forced labourers, the cessation of radio broadcasts, the provision of intelligence and information, the non-destruction of weapons and infrastructure, the yielding-up of Nazi leaders for war-crime trials, and the power of Allied Representatives to issue proclamations, orders, ordinances and instructions covering "additional political, administrative, economic, financial, military and other requirements arising from the complete defeat of Germany". The key article in the third section was article 12, providing that the German Government and German High command would comply fully with any proclamations, orders, ordinances and instructions of the accredited Allied Representatives; as this was understood by the Allies as allowing unlimited scope to impose arrangements for the restitution and reparation of war-damages. Articles 13 and 14 specified the date of surrender and the languages of the definitive texts. 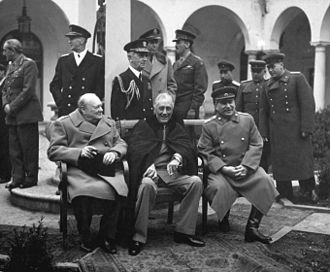 The Yalta Conference in February 1945 led to a further development of the terms of surrender, as it was agreed that administration of post-war Germany would be split into four occupation zones for Britain, France, the United States and the Soviet Union respectively. 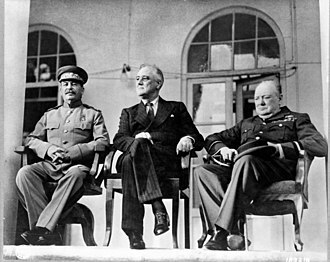 In addition, but separately, it was agreed at Yalta that an additional clause 12a would be added to the July 1944 surrender text; that the Allied Representatives "will take such steps, including the complete disarmament, demilitarisation and dismemberment of Germany as they deem requisite for future peace and security." France, however, was not party to the Yalta agreement, which created a diplomatic problem as formal inclusion of the additional clause in the EAC text would inevitably create a French demand for equal representation in any dismemberment decisions. While this was unresolved, there were in effect two versions of the EAC text; with and without the "dismemberment clause". In the meanwhile, the Combined Chiefs of Staff of the Western Allies had, in August 1944, agreed general guidelines for the terms of local military surrenders to be concluded with any capitulating German forces; capitulation had to be unconditional and restricted to the purely military aspects of a local surrender, no commitments were to be given to the enemy, and surrender was to be without prejudice to any subsequent general instrument of surrender which might replace any document of partial surrender and which would be jointly imposed on Germany by the three Great Powers. These guidelines formed the basis for the series of partial capitulations of German forces to the Western Allies in April and May 1945. In the event of the German signings of Instruments of Surrender at Reims and Berlin, the EAC text was not used; but a simplified, military-only version, based largely on the wording of the partial surrender instrument of German forces in Italy signed at Caserta, was applied instead. The reasons for the change are disputed but may have reflected awareness of the reservations being expressed as to the capability of the German signatories to agree the provisions of the full text or the continued uncertainty over communicating the "dismemberment clause" to the French. On 30 April 1945, Adolf Hitler killed himself in the bunker of the Berlin Chancellery, having drawn up a testament in which Admiral Karl Dönitz succeeded him as Head of State, with the title of Reich President. But with the fall of Berlin two days later, and American and Soviet forces having linked up at Torgau on the Elbe, the area of Germany still under German military control had been split in two. 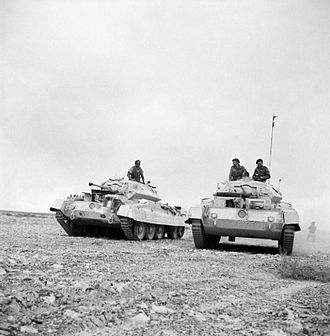 Moreover, the rapidity of the final Allied advances of March 1945 – together with Hitler's insistent orders to stand and fight to the last – had left the bulk of surviving German forces in isolated pockets and occupied territories, mostly outside the boundaries of pre-Nazi Germany. 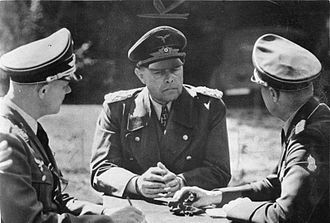 Dönitz attempted to form a government at Flensburg on the Danish border, and was joined there on 2 May 1945 by the Oberkommando der Wehrmacht under Wilhem Keitel, which had previously relocated, first to Krampnitz near Potsdam, and then to Rheinsberg, during the Battle of Berlin. But, although Dönitz sought to present his government as 'unpolitical', there was no repudiation of Nazism, the Nazi party was not banned, leading Nazis were not detained, and the symbols of Hitlerism remained in place. Both the Soviets and the Americans remained adamant in not recognising Dönitz or the Flensburg Government as capable of representing the German state. 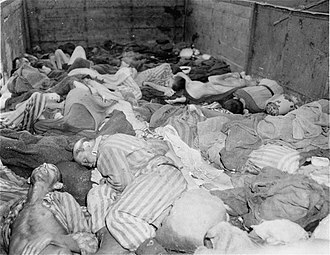 At Hitler's death German armies remained in the Atlantic pockets of La Rochelle, St Nazaire, Lorient, Dunkirk and the Channel Islands; the Greek Islands of Crete, Rhodes and the Dodecanese; southern Norway; Denmark; western Holland; northern Croatia; northern Italy; Austria; Bohemia and Moravia; the Courland peninsula in Latvia; the Hela peninsula in Poland and in Germany towards Hamburg, facing British and Canadian forces; in Mecklenburg, Pomerania and the besieged city of Breslau, facing Soviet forces; and in southern Bavaria towards Berchtesgaden, facing American and French forces. German military commanders in Italy had been conducting secret negotiations for a partial surrender; which was signed at Caserta on 29 April 1945, to come into effect on 2 May. Field Marshal Albert Kesselring, with overall military command for OKW-South, initially denounced the capitulation; but once Hitler's death had been confirmed, acceded to it. 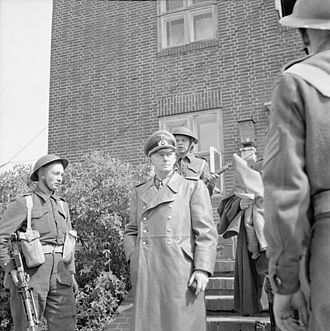 On 4 May 1945, German forces acting under instruction from the Dönitz Government and facing the British and Canadian 21st Army Group, signed an act of surrender at Lüneburg Heath to come into effect on 5 May. 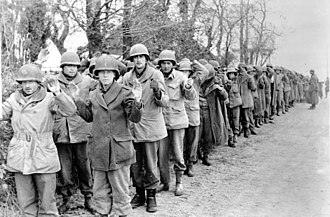 On 5 May 1945, all German forces in Bavaria and Southwest Germany signed an act of surrender to the Americans at Haar, outside Munich; coming into effect on 6 May. The impetus for the Caserta capitulation had arisen from within the local German military command; but from 2 May 1945, the Dönitz government assumed control of the process, pursuing a deliberate policy of successive partial capitulations in the west to play for time in order to bring as many as possible of the eastern military formations westwards so as to save them from Soviet or Yugoslav captivity, and surrender them intact to the British and Americans. In addition, Dönitz hoped to continue to evacuate soldiers and civilians by sea from the Hela peninsula and the surrounding Baltic coastal areas. Dönitz and Keitel were resolved against issuing any orders to surrender to Soviet forces, both from undiminished anti-Bolshevism; but also because they could not be confident they would be obeyed, and might consequently place troops continuing to fight in the position of refusing a direct order, thereby stripping them of any legal protection as prisoners of war. Following these partial capitulations, the major remaining German forces in the field (other than those bottled-up on islands and fortress-ports) consisted of Army Group Ostmark facing Soviet forces in eastern Austria and western Bohemia; Army Group E facing Yugoslav forces in Croatia; the remains of Army Group Vistula facing Soviet forces in Mecklenburg; and Army Group Centre facing Soviet forces in eastern Bohemia and Moravia. From 5 May, Army Group Centre was also engaged in the brutal suppression of the Prague uprising. 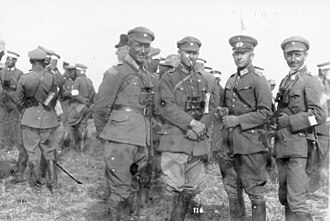 An occupying army of around 400,000 well-equipped German troops remained in Norway, under the command of General Franz Böhme, who was contacted by the German Minister in Sweden early on 6 May, to determine whether a further partial capitulation might be arranged for his forces with neutral Sweden acting as an intermediary, but he was unwilling to comply with anything other than a general surrender order from the German High Command. The surrenders in the west had succeeded in ceasing hostilities between the Western allies and German forces on almost all fronts. At the same time however, the broadcast orders of the Dönitz government continued to oppose any acts of German surrender to Soviet forces in Courland, Bohemia and Mecklenburg; indeed attempting to countermand ongoing surrender negotiations both in Berlin and Breslau. German forces in the east were ordered instead to fight their way westwards. Conscious that, if this were to continue, the Soviet Command would suspect that the Western allies were intending a separate peace (as indeed was exactly Dönitz's intention), Eisenhower determined that no further partial surrenders would be agreed in the West; but instead instructed the Dönitz government to send representatives to SHAEF headquarters in Reims, to agree terms for a general surrender of all German forces simultaneously to all the Allied powers, including the Soviets. General Alfred Jodl signing the capitulation papers of unconditional surrender in Reims. 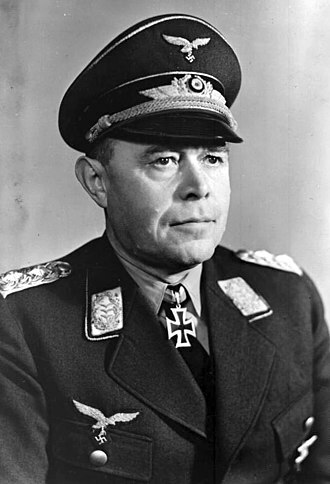 Dönitz's representative, Admiral Friedeburg, informed him on 6 May that Eisenhower was now insisting on "immediate, simultaneous and unconditional surrender on all fronts." 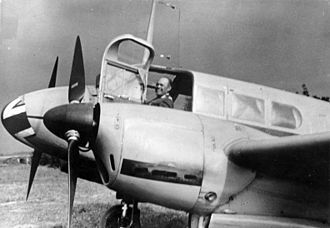 General Jodl was sent to Reims to attempt to persuade Eisenhower otherwise, but Eisenhower shortcircuited any discussion by announcing at 9.00 p.m. on the 6th that, in the absence of a complete capitulation, he would close British and American lines to surrendering German forces at midnight on 8 May and resume the bombing offensive against remaining German-held positions and towns. Jodl telegraphed this message to Dönitz; who responded, authorising him to sign the instrument of unconditional surrender; but subject to negotiating a 48-hour delay, ostensibly to enable the surrender order to be communicated to outlying German military units. Consequently, the first Instrument of Surrender was signed at Reims at 02:41 Central European Time (CET) on 7 May 1945. The signing took place in a red brick schoolhouse, the Collège Moderne et Technique de Reims [fr], that served as the Supreme Headquarters Allied Expeditionary Force (SHAEF). It was to take effect at 23:01 CET (one minute after midnight, British Double Summer Time) on 8 May, the 48 hour grace period having been back-dated to the start of final negotiations. The unconditional surrender of the German armed forces was signed by Jodl, on behalf of the Oberkommando der Wehrmacht (English: "German High Command"). Walter Bedell Smith signed on behalf of the Supreme Commander of the Allied Expeditionary Force and Ivan Susloparov on behalf of the Soviet High Command. French Major-General François Sevez signed as the official witness. Eisenhower had proceeded throughout in consultation with General Antonov of the Soviet High Command; and at his request, General Susloparov had been seconded to the SHAEF Headquarters to represent the Soviet High Command in the surrender negotiations. The text of the act of surrender had been telegraphed to General Antonov in the early hours of 7 May, but no confirmation of Soviet approval had been received by the time of the surrender ceremony, nor was there confirmation that General Susloparov was empowered to sign as representing the Soviet High Command. Accordingly, Eisenhower agreed with Susloparov that a separate text should be signed by the German emissaries; undertaking that fully empowered representatives of each of the German armed services would attend a formal ratification of the act of surrender at a time and place designated by the Allied High Commands. Some six hours after the Reims signing, a response was received from the Soviet High Command stating that the Act of Surrender was unacceptable, both because the text differed from that agreed by the EAC, and because Susloparov had not been empowered to sign. These objections were however, pretexts; the substantive Soviet objection was that the act of surrender ought to be a unique, singular, historical event fully reflecting the leading contribution of the Soviet people to the final victory. They maintained that it should not be held on liberated territory that had been victimized by German aggression, but at the seat of government from where that German aggression sprang: Berlin. Furthermore, the Soviets pointed out that, although the terms of the surrender signed in Reims required German forces to cease all military activities and remain in their current positions; they were not explicitly required to lay down their arms and give themselves up, "what has to happen here is the surrender of German troops, giving themselves up as prisoners". Eisenhower immediately agreed, acknowledging that the act of surrender signed in Reims should be considered "a brief instrument of unconditional military surrender", and undertook to attend with correctly accredited representatives of the German High Command for a "more formal signing" of a suitably amended text presided over by Marshal Zhukov in Berlin on 8 May. Furthermore, he issued a clarificatory statement that any German forces continuing to fight against the Soviets after the stated deadline would "no longer have the status of soldiers"; and hence, if they were to surrender to the Americans or British, would then be handed back into Soviet captivity. 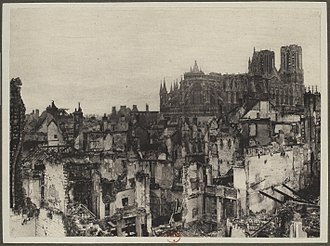 The effect of the Reims signing was limited to a consolidation of the effective ceasefire between German forces and the Western Allies. 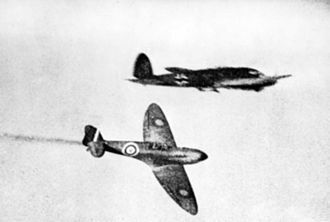 Fighting continued unabated in the east however, especially as German forces now intensified their air and ground assault against the Prague uprising, while the seaborne evacuation of German troops across the Baltic continued. 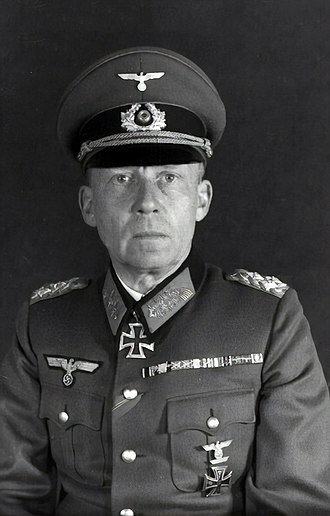 Dönitz issued new commands that resistance to Soviet forces should be maintained, taking advantage of the 48-hour grace period to order redoubled efforts to save German military units from Soviet captivity; and it soon became clear that he had authorised the signing of a general surrender at Reims in bad faith, and that consequently neither the Soviet Command nor the German forces would accept the Reims surrender as effecting an end to hostilities between them. General Ferdinand Schörner commanding Army Group Centre, broadcast a message to his troops on 8 May 1945 denouncing "false rumours" that the OKW had surrendered to the Soviet Command as well as the Western Allies; "The struggle in the west however is over. But there can be no question of surrender to the Bolsheviks." Consequently, Eisenhower arranged for the commanders in chief of each of the three German armed services in person to be flown from Flensburg to Berlin early on 8 May; where they were kept waiting through the day until 10:00 p.m. when the Allied delegation arrived, at which point the amended surrender text was provided to them. 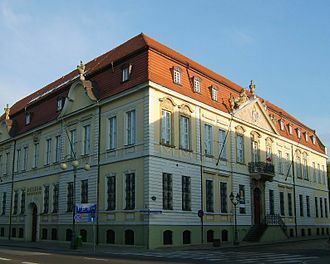 The definitive Act of Military Surrender was dated as being signed before midnight on 8 May at the seat of the Soviet Military Administration in Berlin-Karlshorst, now the location of the German-Russian Museum Berlin-Karlshorst. Since Eisenhower as Supreme Allied Commander for Western Europe technically outranked Zhukov, the act of signing on behalf of the Western Allies passed to his deputy, Air Chief Marshal Tedder. The proposed Soviet amendments to the Reims surrender text were accepted without difficulty by the Western Allies; but the identification and designation of the Allied signatories proved more problematic. French forces operated under SHAEF command, but General de Gaulle was demanding that General de Tassigny sign separately for the French High Command; but in that case it would be politically unacceptable for there to be no American signature on the definitive surrender document, while the Soviets would not agree to there being more than three Allied signatories in total - one of whom would have to be Zhukov. After repeated redrafts, all of which needed translating and retyping, it was finally agreed that both French and American signatures would be as witnesses. But the consequence was that the final versions were not ready for signing until after midnight. Consequently, the physical signing was delayed until nearly 1.00 a.m. on 9 May, Central European Time; and then back-dated to 8 May to be consistent with the Reims agreement and the public announcements of the surrender already made by Western leaders. 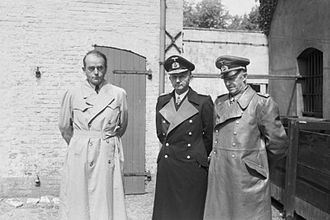 The definitive Act of Military Surrender differed from the Reims signing principally in respect of requiring three German signatories, who could fully represent all three armed services together with the German High Command. Otherwise the amended text set out an expanded article 2, now requiring German forces to disarm and hand over their weapons to local allied commanders. This clause had the effect of ensuring that German military forces would not only cease military operations against regular allied forces; but would also disarm themselves, disband, and be taken into captivity. Field Marshal Keitel initially balked at the amended text, proposing that an additional grace period of 12 hours be granted to surrendering German forces, before they might be exposed to punitive action for non-compliance under article 5. In the event, he had to be satisfied with a verbal assurance from Zhukov. We the undersigned, acting by authority of the German High Command, hereby surrender unconditionally to the Supreme Commander, Allied Expeditionary Force and simultaneously to the Supreme High Command of the Red Army all forces on land, at sea, and in the air who are at this date under German control. The German High Command will at once issue orders to all German military, naval and air authorities and to all forces under German control to cease active operations at 23.01 hours Central European time on 8 May 1945, to remain in all positions occupied at that time and to disarm completely, handing over their weapons and equipment to the local allied commanders or officers designated by Representatives of the Allied Supreme Commands. No ship, vessel, or aircraft is to be scuttled, or any damage done to their hull, machinery or equipment, and also to machines of all kinds, armament, apparatus, and all the technical means of prosecution of war in general. The German High Command will at once issue to the appropriate commanders, and ensure the carrying out of any further orders issued by the Supreme Commander, Allied Expeditionary Force and by the Supreme Command of the Red Army. Admiral Friedeburg was the only representative of the German forces to be present at the signing of the German instruments of surrender in Luneburg Heath on 4 May 1945, in Reims on 7 May and in Berlin on 8 May 1945. Generaladmiral von Friedeburg committed suicide shortly afterwards, on 23 May 1945, upon the dissolution of the Flensburg Government. For the most part, the Berlin signing did the job required of it; with German forces in Courland and the Atlantic outposts all surrendering on 9 May within the informal 12-hour grace period. Surrender to the Soviets in Bohemia and Moravia took rather longer to achieve, with some German forces in Bohemia continuing to attempt to fight their way towards the American lines. Nevertheless, the principle of a common surrender broadly held; and units seeking to defy it were denied passage west, perforce having to surrender to the Soviets. The exception was Army Group E in Croatia, which fought on for several days attempting to force an escape from the partisan forces of Marshal Tito, such that many soldiers from these units did succeed in surrendering to General Alexander in Italy. These included considerable numbers of Ustase collaboration troops, who were subsequently returned to Yugoslavia; and who were all promptly executed without trial. The Reims signing ceremony had been attended by considerable numbers of reporters, all of whom were bound by a 36-hour embargo against reporting the capitulation. As it became clear that there would need to be a definitive second signing before the Act of Surrender could become operative, Eisenhower agreed that the news blackout should remain; so that all Allied powers could celebrate Victory in Europe together on 9 May 1945. However, Edward Kennedy of the Associated Press news agency in Paris broke the embargo on 7 May, with the consequence that the German surrender was headline news in the western media on 8 May. Realising that it had become politically impossible to keep to the original timetable, it was eventually agreed that the Western Allies would celebrate Victory in Europe Day on 8 May, but that western leaders would not make their formal proclamations of Victory until that evening (when the Berlin signing ceremony should be imminent). The Soviet government made no public acknowledgement of the Reims signing, which they did not recognise; and so, maintaining the original dates, celebrated Victory Day on 9 May 1945. The signing in Berlin took place 9 May 1945 at 00:16 local time. The capitulation was effective backwards, from 8 May 1945 at 23:01 Central European Time. That means time of both signing and capitulation was on 9 May according to Moscow Time. 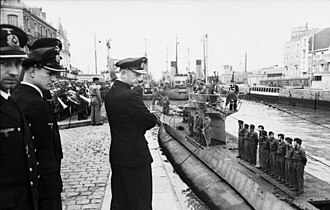 Although the German military signatories of the May 1945 German Instruments of Surrender had been acting under instructions from Admiral Dönitz, none of the Allied Governments recognised the acting Flensburg Government as validly exercising civil power, and consequently the Allies had insisted that the German signatories should explicitly represent the German High Command alone. On 23 May 1945, the purported German government in Flensburg was abolished, and its members taken into captivity as prisoners of war. During 1944 and 1945 formerly neutral countries, and former German allies, had been joining the Allied Powers and declaring war on Germany. The German embassies to these countries had been closed down, with their property and archives held in trust by a nominated protecting power (usually Switzerland or Sweden) under the terms of the Geneva Conventions; with counterpart arrangements for the former embassies of Allied countries in Berlin. The United States State Department had prepared for the diplomatic consequences of the war's ending on the assumption that there would have been an explicit statement of unconditional surrender of the German state in accordance with the agreed EAC surrender text. In the final days of April 1945, the State Department had notified the protecting powers, and all other remaining neutral governments (such as Ireland), that following the forthcoming German surrender, the continued identity of the German state would rest solely in the four Allied Powers, who would immediately recall all German diplomatic staff, take ownership of all German state property, extinguish all protecting power functions, and require the transfer of all archives and records to one or another of the embassies of the western Allies. On 8 May 1945, these arrangements were put into effect in full, notwithstanding that the only German parties to the signed surrender document had been the German High Command; the western Allies maintaining that a functioning German state had already ceased to exist, and consequently that the surrender of the German military had effected the complete termination of Nazi Germany. As the protecting powers complied fully with the Allied demands, the German state ceased as a diplomatic entity on 8 May 1945 (Imperial Japan, the only remaining Axis belligerent, having already denounced the German surrender and unilaterally seized the German embassy in Tokyo). Nevertheless, as the surrender instrument of 8 May 1945 had been signed only by German military representatives, the full civil provisions for the unconditional surrender of Germany remained without explicit formal basis. Consequently, the EAC text for Unconditional Surrender of Germany, redrafted as a declaration and with an extended explanatory preamble, was adopted unilaterally by the now four Allied Powers as the Declaration regarding the defeat of Germany on 5 June 1945. This spelled out the Allied position that as a result of its complete defeat Germany had no government or central authority, and that the vacated civil authority in Germany had consequently been assumed solely by the four Allied Representative Powers (the United States of America, the Union of Soviet Socialist Republics, the United Kingdom and the French Republic) on behalf of the Allied Governments overall, an authority subsequently constituted into the Allied Control Council. Stalin had, however, already backtracked on his previous support for the principle of German dismemberment, publicly renouncing any such policy in his victory proclamation to the Soviet people of 8 May 1945. Consequently, there was no "dismemberment clause" in the Berlin declaration text. ^ a b Ziemke, Earl Frederick (1990). The US Army and the Occupation of Germany 1944-1946. Center of Military History, United States Army. p. 114. ^ a b c d e Hansen, Reimar (1995). "Germany's Unconditional Surrender". History Today. 45 (5 May). ^ Ziemke, Earl Frederick (1990). The US Army and the Occupation of Germany 1944-1946. Center of Military History, United States Army. p. 115. ^ a b c d Mosely, Philip E (1950). "Dismemberment of Germany, the Allied Negotiations from Yalta to Potsdam". Foreign Affairs. 28 (3): 487. ^ Ziemke, Earl Frederick (1990). The US Army and the Occupation of Germany 1944-1946. Center of Military History, United States Army. p. 257. ^ Jones, Michael (2015). After Hitler: The Last Days of the Second World War in Europe. John Murray. p. 205. ^ Kershaw, Ian (2012). The End; Germany 1944-45. Penguin. p. 298. ^ Kershaw, Ian (2012). The End; Germany 1944-45. Penguin. p. 362. ^ a b Kershaw, Ian (2012). The End; Germany 1944-45. Penguin. p. 368. ^ a b c Kershaw, Ian (2012). The End; Germany 1944-45. Penguin. p. 371. ^ Kershaw, Ian (2012). The End; Germany 1944-45. Penguin. p. 365. ^ Doerries, Reinhard. R. (2009). Hitler's Intelligence Chief. Enigma. p. 223. ^ Jones, Michael (2015). After Hitler: The Last Days of the Second World War in Europe. John Murray. p. 101. ^ a b c Kershaw, Ian (2012). The End; Germany 1944-45. Penguin. p. 370. ^ Jones, Michael (2015). After Hitler: The Last Days of the Second World War in Europe. John Murray. p. 211. ^ I remember the German surrender, Kathryn Westcott, BBC News, 4 May 2005. ^ Video: Beaten Nazis Sign Historic Surrender, 1945/05/14 (1945). Universal Newsreel. 1945. Retrieved 20 February 2012. ^ a b Ziemke, Earl Frederick (1990). The US Army and the Occupation of Germany 1944-1946. Center of Military History, United States Army. p. 258. ^ Jones, Michael (2015). After Hitler: The Last Days of the Second World War in Europe. John Murray. p. 217. ^ a b Jones, Michael (2015). After Hitler: The Last Days of the Second World War in Europe. John Murray. p. 259. ^ a b Kershaw, Ian (2012). The End; Germany 1944-45. Penguin. p. 372. ^ Jones, Michael (2015). After Hitler: The Last Days of the Second World War in Europe. John Murray. p. 265. ^ Jones, Michael (2015). After Hitler: The Last Days of the Second World War in Europe. John Murray. p. 313. ^ Caruso, David B. (4 May 2012). "AP apologizes for firing reporter over WWII scoop". The Associated Press. Retrieved 15 October 2018. ^ Ziemke, Earl Frederick (1990). The US Army and the Occupation of Germany 1944-1946. Center of Military History, United States Army. p. 263. ^ Eckert, Astrid. M. (2012). The Struggle for the Files. Translated by Dona Geyer. CUP. p. 222. Wikimedia Commons has media related to Instrument of German surrender, World War II. Adolf Hitler killed himself by gunshot on 30 April 1945 in his Führerbunker in Berlin. 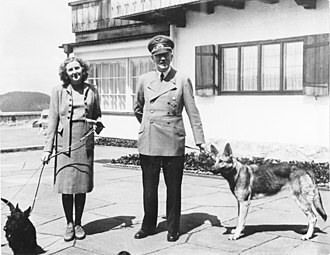 His wife Eva Braun committed suicide with him by taking cyanide, records in the Soviet archives show that their burnt remains were recovered and interred in successive locations until 1970, when they were again exhumed and the ashes scattered. Accounts differ as to the cause of death, one states that he died by poison only, contemporary historians have rejected these accounts as being either Soviet propaganda or an attempted compromise in order to reconcile the different conclusions. One eye-witness recorded that the body showed signs of having been shot through the mouth, there is controversy regarding the authenticity of skull and jaw fragments which were recovered. In 2009, American researchers performed DNA tests on a skull Soviet officials had believed to be Hitlers. The tests and examination revealed that the skull was actually that of a less than 40 years old. The jaw fragments which had recovered were not tested. By early 1945, Germanys military situation was on the verge of total collapse, poland had fallen to the advancing Soviet forces, who were, by then, preparing to cross the Oder between Küstrin and Frankfurt with the objective of capturing Berlin,82 kilometres to the west. German forces had recently lost to the Allies in the Ardennes Offensive, with British, American forces in the south had captured Lorraine and were advancing towards Mainz and the Rhine. 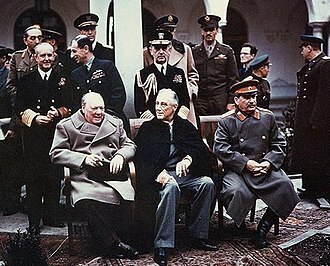 In parallel to the actions, the Allies had met at Yalta between 4–11 February to discuss the conclusion of the war in Europe. Hitler, presiding over a rapidly disintegrating Third Reich, retreated to his Führerbunker in Berlin on 16 January 1945, to the Nazi leadership, it was clear that the battle for Berlin would be the final battle of the war in Europe. Some 325,000 soldiers of Germanys Army Group B were surrounded and captured on 18 April, by 11 April the Americans crossed the Elbe,100 kilometres to the west of the city. 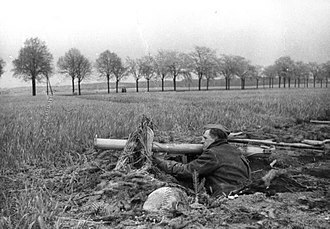 On 16 April, Soviet forces to the east crossed the Oder and commenced the battle for the Seelow Heights, by 19 April the Germans were in full retreat from Seelow Heights, leaving no front line. The government was formed following the suicide of Adolf Hitler on 30 April during the Battle of Berlin. It was headed by Grand Admiral Karl Dönitz as the Reichspräsident, the administration was referred to as the Flensburg Government because Dönitzs headquarters had been relocated in the port of Flensburg in northern Germany on 3 May 1945. Following the capitulation of all German armed forces on 8 May, the Flensburg government lost all direct territorial, military or civil jurisdiction, the western Allies allowed it to continue to meet and conduct what business it could until 23 May. Himmler took the chair as the acknowledged deputy Führer, since the disgrace and dismissal of Hermann Göring, as they were leaving Rheinsberg on 28 April, Himmler asked Dönitz to confirm that he would be willing to serve in a successor government that Himmler might form. That day however, the British and Americans published Himmlers secret proposals for a peace in the West. 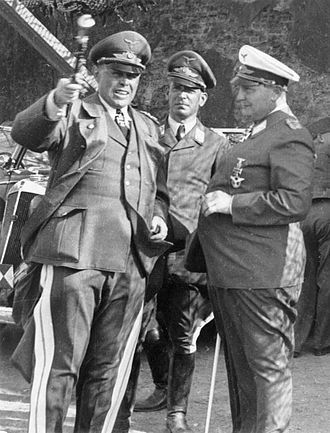 On 29 April Dönitz received a telegram from Martin Bormann announcing Himmlers dismissal from all posts, Dönitz went to Himmlers headquarters in Lübeck on 30 April to confront him with the accusations, but Himmler denied them as fabricated propaganda. Goebbels committed suicide in the Berlin Führerbunker on 1 May, the same day Dönitz accepted the offices of Supreme Commander and Head of State in separate broadcast addresses to the German armed forces, and German people. Residual ministers of the Hitler cabinet, who had fled from the fall of Berlin to join Dönitz at the Wehrmacht barracks near Plön in Holstein, von Krosigks cabinet first met in Eutin, to which he and his ministerial staff had been evacuated, on 2 May. 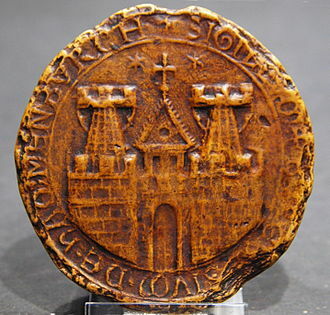 Moreover, the situation of the Protectorate of Bohemia and Moravia was highly unstable. Dönitz decided instead to proceed to the Mürwik naval academy in Flensburg near the Danish border, the cabinet met in the Sportschool of the naval academy, while administrative offices and accommodation for the various ministries were established on the liner Patria, moored in Flensburg harbour. Herbert Backe had been the author of the Hunger Plan of 1941, speers deputy in the Economics Ministry was Otto Ohlendorf, who had personally directed the murder of hundreds of thousands of Jews and Communists in occupied Soviet territory. Wilhelm Stuckart had been a participant at the Wannsee Conference of January 1942, Dönitzs cabinet picks were clearly circumscribed by who was available. For the first few days the post of Minister of the Interior was kept vacant and this had been the office of Heinrich Himmler, but Himmler had been condemned as a traitor, dismissed from all functions and ordered to be arrested in Hitlers Last Testament. Dönitz did not want Himmlers name associated with his new government and he tacitly set Hitlers instructions aside and continued to see Himmler on a daily basis without according him any formal appointment. It was only on 6 May 1945, while negotiations were in prospect for a capitulation to U. S. General Dwight D. Eisenhower in the west, that Dönitz dismissed Himmler from all his posts, Jodl was to represent Dönitz in negotiations with the Allies in Reims, France. Admiral Hans-Georg von Friedeburg was appointed to succeed Dönitz as Commander of the Kriegsmarine, the Air Force had largely been destroyed or grounded due to lack of fuel, so no new appointment was made, Field Marshal Robert Ritter von Greim remaining Commander of the Luftwaffe. 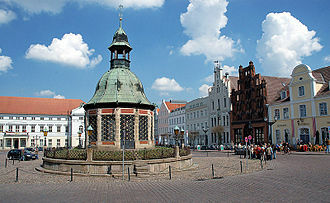 Courland or Kurzeme is one of the historical and cultural regions of Latvia. The regions of Semigallia and Selonia are sometimes considered as part of Courland as they were held by the same duke. Situated in western Latvia, Courland roughly corresponds to the former Latvian districts of Kuldīga, Liepāja, Talsi, when combined with Semigallia and Selonia, Courlands northeastern boundary is the river Daugava, which separates it from the regions of Latgale and Vidzeme. To the north, Courlands coast lies along the Gulf of Riga, on the west it is bordered by the Baltic Sea, and on the south by Lithuania. It lies between 55° 45′ and 57° 45′ North and 21° and 27° East, the area comprises 27,286 km², of which 262 km² is made up of lakes. The landscape generally has a low and undulating character, with flat, the interior features wooded dunes, covered with pine, spruce and oak, with swamps and lakes, and fertile patches between. Courlands elevation never rises more than 213 m above sea level, the Jelgava plain divides Courland into two parts, the western side, which is fertile and densely inhabited, except in the north, and the eastern side, less fertile and thinly inhabited. Nearly one hundred rivers drain Courland, but only three of these rivers – the Daugava, the Lielupe and the Venta – are navigable and they all flow northwestward and discharge into the Baltic Sea. Owing to its numerous lakes and marshes, Courland has a damp, often foggy, in ancient times the Curonians, a pagan tribe, inhabited Courland. 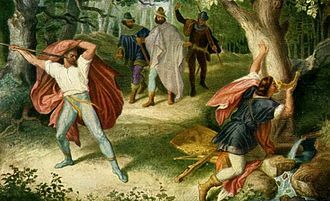 The Brethren of the Sword, a German military order, subdued the Curonians, in 1237 the area passed into the rule of the Teutonic Knights owing to the amalgamation of this order with that of the Brethren of the Sword. The Livonian Confederation was a loosely organized confederation formed by the German-led Livonian Order and it existed from 1228 to the 1560s, when it was dismembered during the Livonian Wars. The Duchy of Courland and Semigallia was a semi-independent duchy that existed from 1561 until 1795, encompassing the areas of Courland, although nominally a vassal state of the Polish-Lithuanian Commonwealth, the dukes operated autonomously. 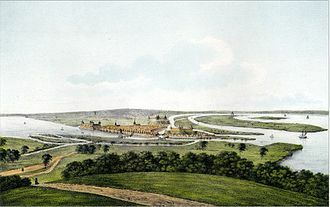 In the 18th century Russia acquired great influence over the Duchy, in 1795, the last Duke, Peter von Biron, ceded the Duchy to the Russian Empire. Army Group Vistula was an Army Group of the Wehrmacht, formed on 24 January 1945. It was put together elements of Army Group A, Army Group Centre. It was formed to protect Berlin from the Soviet armies advancing from the Vistula River, heinz Guderian had originally urged the creation of a new army group as an essentially defensive measure to fill the gap opening in German defences between the lower Vistula and the lower Oder. 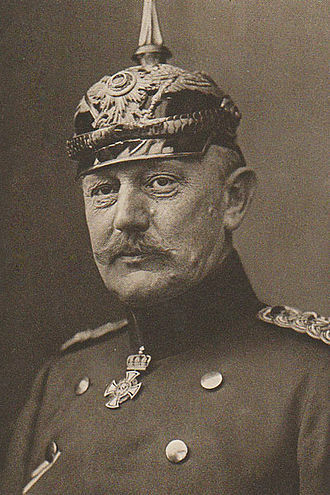 The new Army Group Vistula was duly formed from an assortment of rebuilt, Guderian intended to propose Field-Marshal Maximilian von Weichs as commander. However, in a reflection of Hitlers desire to control of the conflict from the Wehrmacht to the SS. This now held lines on the Oder and was progressively rebuilt, the Second Army of Colonel-General Walter Weiss, which as part of Army Group Centre had been defending the line of the Narew river on the borders of East Prussia. The East Prussian Offensive had cut it off from the remnants of its parent formation and it therefore formed the new army groups northern and eastern flank. The Prague uprising was an attempt by the Czech resistance to liberate the city of Prague from German occupation during World War II. Events began on May 5,1945, in the last moments of the war in Europe, the uprising went on until May 8,1945, ending in a ceasefire between the Czech resistance and the German army, which decided to quit Prague on the same day. Next morning, the Red Army entered the liberated city. The most important task of the Czechs was to stop the Germans from disturbing what Czechoslovak territory they occupied as well as to stop them from continuing the war on Czech soil. The goal of the resistance was to force the German occupants to retreat to Germany, the Czech Resistance needed the support and help of the Red Army in order to become fully liberated. As the end of the war came closer, it had an effect on the residents all over Czechoslovakia. 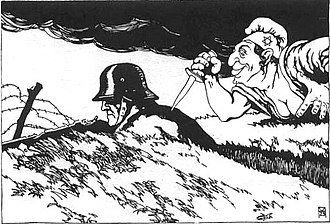 In fact, it strengthened their longing to explicitly demonstrate their bitter hatred toward the German occupants, during the German occupation of Czechoslovakia, tensions had built up because of oppression. This would lead to the expulsion of three million Sudeten Germans from their homes of 800 years, in the spring of 1945 throughout Czechoslovakia, there were both many large and small partisan groups that totaled about 7,500 people. For example, there were some lines the Germans could use only in the daytime, on the eve of the uprising, the propaganda activities of the group called the Communist Youth, were in full swing, but didn’t last long. The communist groups whose solidarity had been broken by arrests in March were somehow able to work under the circumstances of illegality. From 30 April-1 May 1945, the Waffen-SS Senior Group Leader, as rumors of an impending Allied approach reached Prague, the people of Prague streamed into the streets to welcome the victors. 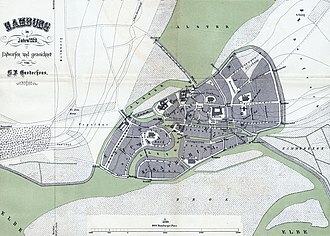 Frank ordered the streets to be cleared and instructed the German army, on 5 May, the uprising was triggered in the morning by a broadcast on Czech radio. In a mixture of Czech and German, the broadcast announced, with the sounds of combat in the background, the radio station continued to broadcast messages of defiance, encouraging citizens to revolt. Situation of World War II in Europe at the time of Hitler's death. 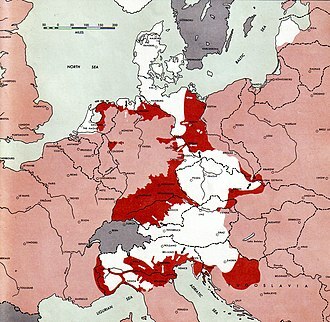 The white areas were controlled by Nazi forces, the pink areas were controlled by the Allies, and the red areas indicate recent Allied advances. In an arranged photo commemorating the meeting of the Soviet and American armies, 2nd Lt. William Robertson (U.S. Army) and Lt. Alexander Silvashko (Red Army) stand facing one another with hands clasped and arms around each other's shoulders. In the background are two flags and a poster. At the 2015 commemoration of Elbe Day, Russian Ambassador Sergey Kislyak bows his head after laying a wreath at the Spirit of the Elbe marker in Arlington National Cemetery. Marshal Zhukov reading the German capitulation. 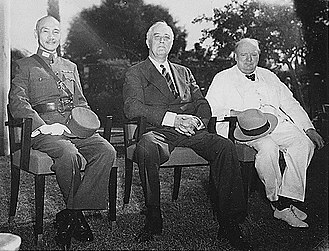 Seated on his right is Air Chief Marshal Arthur Tedder.